The ability to monitor, visualize, and analyze relevant data gives today’s businesses, across a host of sectors, the power to understand their prospects, make informed decisions, increase efficiencies, and work towards a set of rewarding long term goals. Experts predict that in just five years, the number of smart connected devices on the planet will come close to 30 billion – all of which will generate data that can be shared, collected, and analyzed. Now, with so much data available to today’s brands and businesses, to extract the every drop of value from an ever-growing raft of digital insights and set the kind of KPIs that will drive your venture forward, having an easy to use, visually-stunning dashboard is key. 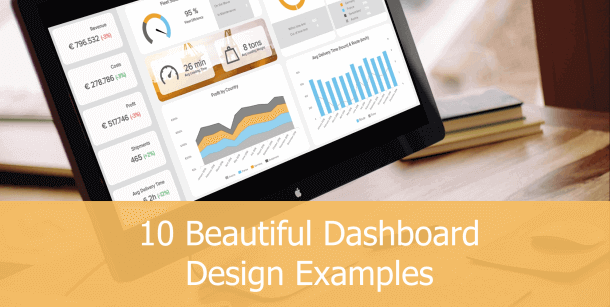 That said, there are a host of cool dashboard designs available today, and we’re going to introduce you to ten of the best, each hand-picked from our ever-growing selection of dashboard design examples. Get a pocket-sized summary of our 10 most dazzling data dashboards! Dashboard design is the art of displaying comprehensively and thoughtfully all the insights you gained from your data analysis. 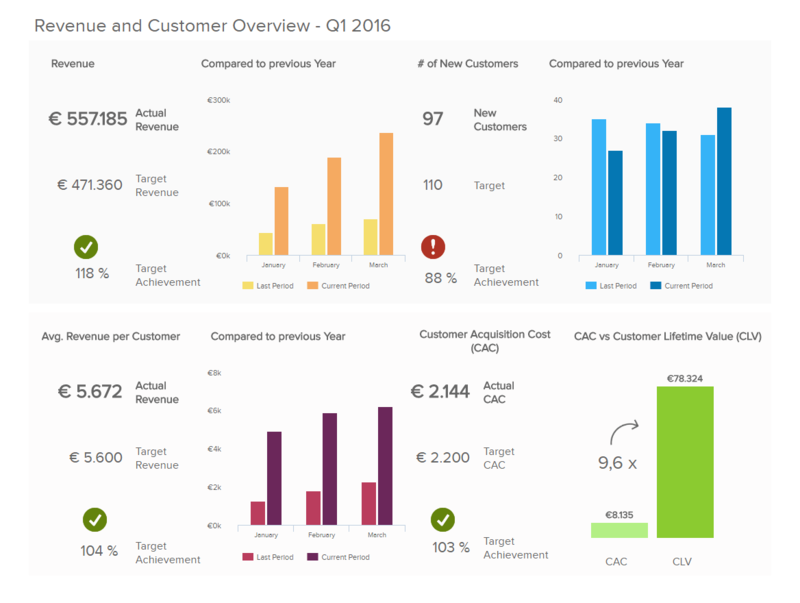 Building an effective report following some dashboard design principles is crucial to a comprehensive BI process. When working with your analytics and digging out insights from your data, the best way to understand it is through visualization. Dashboard design is the cherry on top that will let you make sense of all the your findings, and shouldn’t be underestimated: poorly designed dashboards not only fail to convey their important information, but they can also make the data even less comprehensible and confuse readers further. Spanning a selection of core industries, sectors, and departments, these awesome dashboard designs & examples are not only incredibly efficient and functional, but also will not tire you of looking at them on a day-to-day basis. First of our dashboard design examples, the marketing KPI dashboard is the perfect companion of marketing managers, executives, and budding business owners looking to reach out and connect with new prospects, the marketing dashboard provides a navigable overview of critical KPIs that give a comprehensive insight into elements such as cost per acquisition, customer lifetime value, and most importantly, return on investment. Not only will this dashboard help you to improve, personalize, and enhance your business’s most important ongoing promotional activities, but as it is one of our most intuitive dashboard designs, obtaining snapshots of relevant data is quick and easy on the eye. 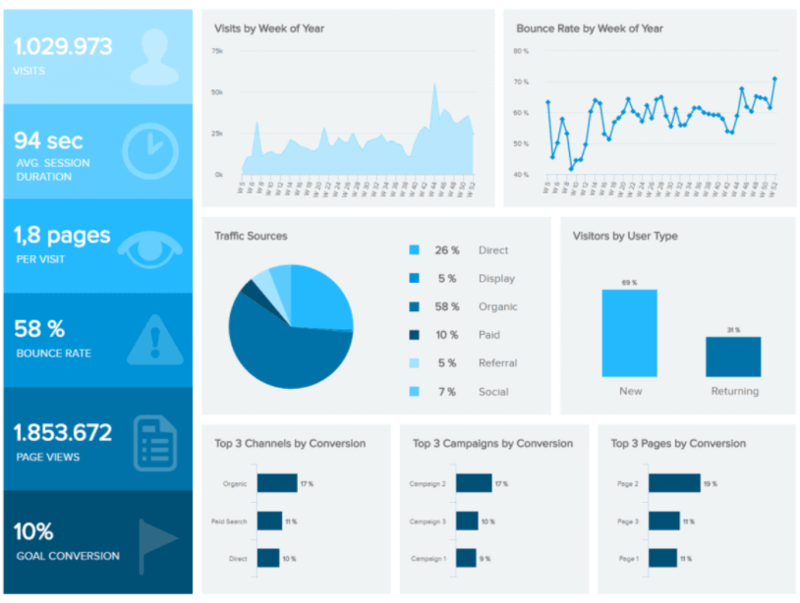 When you’re talking about awesome dashboard designs that provide an easy-to-digest overview of critical marketing KPIs in addition to a logical, aesthetically satisfying layout, our web analytics dashboard certainly delivers. Incredible design aside, this invaluable dashboard is a powerful tool for marketing pursuits and activities across a broad range of sectors as it bestows you with the ability to understand the behavior of your users on a deeper level, in turn, empowering you to connect with your target audience on a more meaningful level while significantly improving the user experience (UX) of your website. For those responsible for their business’s ongoing sales conversions, optimization, and strategy, this particular dashboard boasts a wealth of insights into acquisition costs, management metrics, target revenue and more in one neat and tidy place. 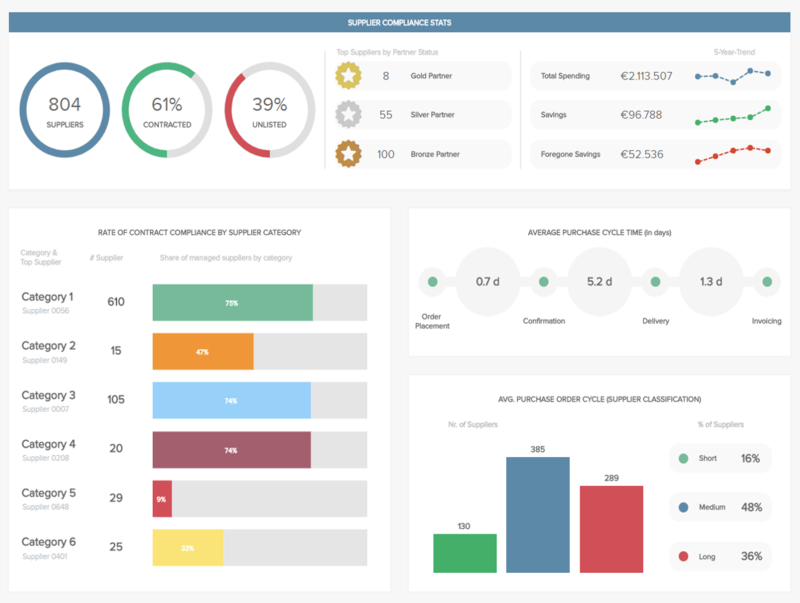 Moreover, this sales report-inspired dashboard sports one of the best designs on the market, visualizing key data through a mix of perfectly color-coded graphs and charts that are not only pleasing to look at but also make extracting important information swift and simple. It gives top executives a good overview and a strong tool to make the best data-driven decisions for their business. When it comes to your company’s ongoing financial health, one of the most critical areas to focus on is your spending efficiency, and a failure to do so could cost your organization a great deal of unnecessary expenses in the long run. 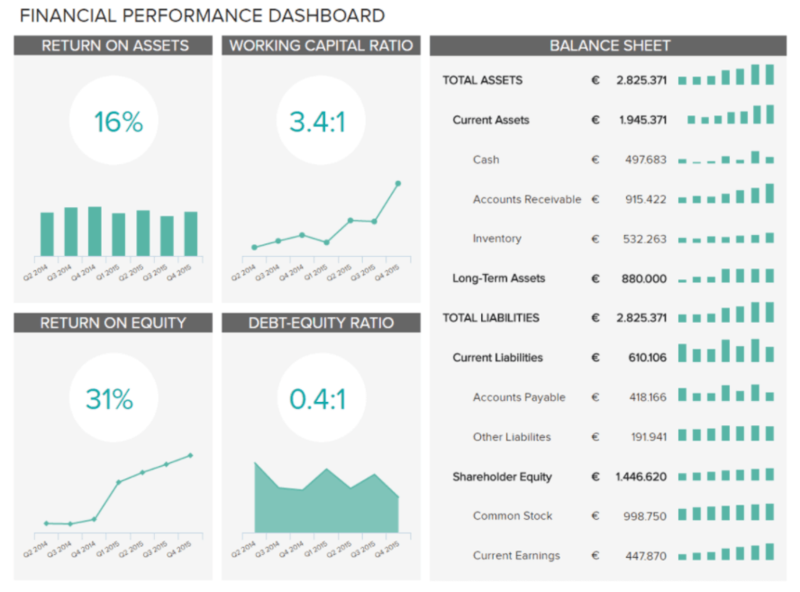 One of our great dashboard design inspiration, our financial dashboard tracks performance and drills down into returns on equity and assets and its linear yet attractive balance sheet coupled with its wonderfully arranged metric charts make it a joy to use. Your business is only as effective as your workforce which is the very reason that monitoring both individual and collective employee performance is so vital. Ideal for HR managers and those responsible for specific departments, the employee performance dashboard is one of our top dashboard design examples with scannable screen arrangement and a striking color scheme to match. By understanding your employees’ strengths, weaknesses, and behavior you will be able to make the changes you need to motivate, inspire, and engage your team for success – and this HR dashboard will help you do just that. In today’s hyper-connected digital world, the consumer reigns the supreme hold, trusting the opinions and testimonials of their peers above all else. That said, keeping your customers happy consistently is of paramount importance to any modern business. One of our most popular and effective dashboard design templates, focusing on customer satisfaction metrics, is geared towards maintaining a solid NPS score, retaining valuable customers, and optimizing your service levels to remain competitive in a cutthroat commercial landscape. Boasting a digestible color coordination key and a symmetrical design that has been developed for the swift analysis of critical consumer information, this is the dashboard you need to satisfy existing customers and attracting new people to your business. Building on our previous point: to deliver exceptional levels of service to your customers, your customer service team must be happy, productive, cohesive, and firing on all cylinders. As far as great dashboard designs go, this is up there with the best of them, and it offers all of the customer service KPIs and metrics you need to improve your department, develop your staff’s skills, and enrich your consumer-facing strategies. Plus, this most epic of dashboard designs will make improving your customer service efforts and spotting key trends a genuine pleasure rather than an undesirable chore. Regardless of your industry or niche, it’s likely that you will have a procurement process or department to ensure the efficient delivery of products, services, and assets. And in many ways, this is one of the backbones of your entire operation. One of the top dashboard design inspiration in the lineup, our procurement overview platform provides a detailed bird’s eye overview of important procurement KPIs such as purchase order lifecycles, supplier performance, supplier volumes, and compliance rates. In addition to offering the insights required to make your procurement processes as smooth and cost-effective as possible, the design allows you to view all relevant silos of information in logical segments, speeding up the decision-making process as a direct result. It doesn’t matter what industry you’re involved with, the IT department requires an exceptional level of efficiency and organization to ensure that the company’s infrastructure is operational. A failure to do so could result in disaster. To help avoid such detrimental issues, we have developed an IT issue tracker – and it’s one of our best dashboard designs to date. 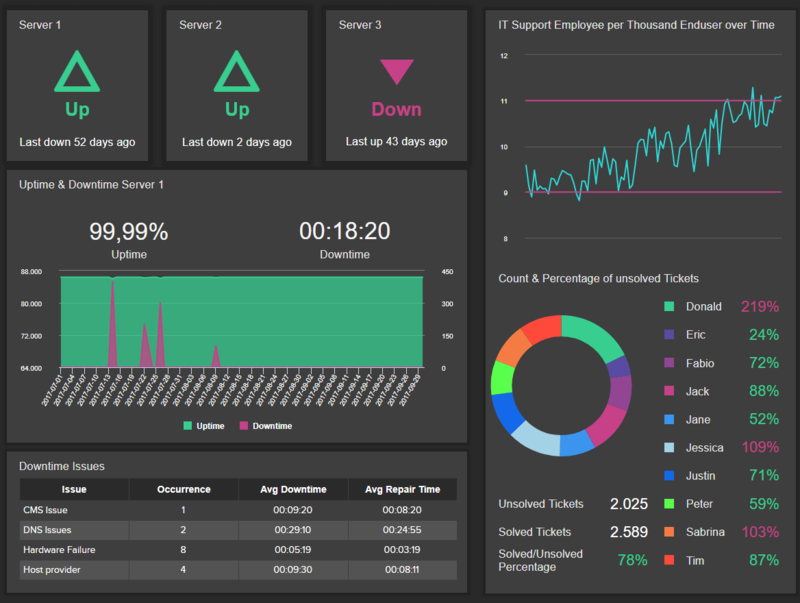 With an irresistible interface, this IT dashboard not only helps technical staff make critical improvements to infrastructure and task completion times but its striking design exists to help manage unsolved tickets, issues, and critical server information with ease. 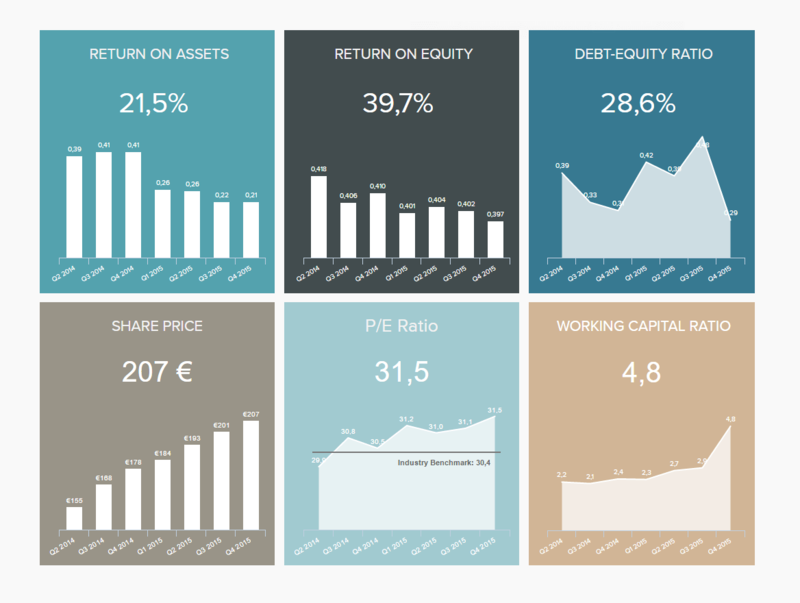 For senior personnel and key departmental managers, this most excellent of dashboard designs provides a functional snapshot of all of the activity, trends, and patterns related to the company’s investments and investors. This financial report example is very helpful to any investor who wants to know where they put their money in. Assisting in the management and continual development, optimization of all investment-based pursuits, this tool is invaluable and as one of our best dashboard design inspiration, all of the information you need is displayed in the kind of graphics that you will want to engage with on a daily basis. 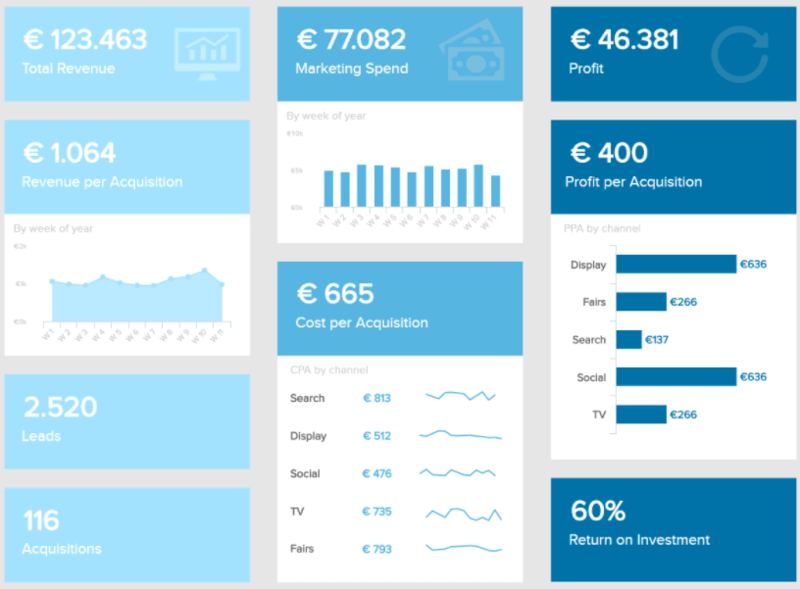 We hope this carefully curated list of our great dashboard designs has served to inspire and enlighten you, and if you’d like to learn more about our KPIs and enjoy a comprehensive insight into the rest of our department-specific metrics and tools, do not hesitate to have a look at our numerous business dashboard examples. Whether you are convinced or still skeptical, you can try out our software during 14 days thanks to our free trial or contact us for more information!